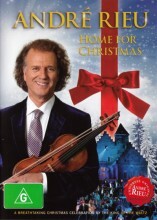 Andre Rieu Home For Christmas DVD from DVDLand. A great new Andre Rieu DVD for Christmas. The latest Christmas Special by André Rieu and the JSO. Filmed at his castle, the church behind his house and the narrow streets of Maastricht. Click the button below to add the ANDRE RIEU - HOME FOR CHRISTMAS to your wish list.